Getting their groove on for a fourth album, Burning on the Wings of Desire, is Blood of the Sun. Founders Henry Vasquez (Saint Vitus, Archie Bunker) on drums and Dave Gryder (Storm at Sunrise) on keyboards, unashamedly push some great Seventies-style hard rock. This time around their helped by quintessential heavy rocker Tony Reed (Stone Axe, Mos Generator), who produced and plays guitar and bass on the album. Another heavy rock veteran, Wino, does the vocals on Good and Evil for the band. Blood of the Sun:: Good & Evil video. To the point: if you don't know Blood of the Sun, and I didn't until now, you got to check these guys out. This is great, melodic and groovy, heavy rock with touches of boogie and blues, lots of freaked out, almost psychedelic guitar work, and crazy good old school Hammond organ. Rock and roll, fundamentally, was always about having a good time, letting loose without doing harm, and this music fits. All the tracks are classic and easily deliver the sound BotS is going for: 70's rock. The only downside is the aptly named Brings Me Down which is a slow burner, but with some mighty fine piano. Otherwise, Burning on the Wings of Desire hits the classic heavy rock mark. Strongly recommended. 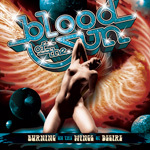 Blood of the Sun's Burning on the Wings of Desire is quintessential and classic Seventies melodic heavy rock, with lots of energy, groove, boogie, and blues. Get this album: nuff said.